Far away from the bustling, noisy world we call civilization, there's a place just for you where you leave your cares behind and your troubles at home... Brockway Springs Resort. 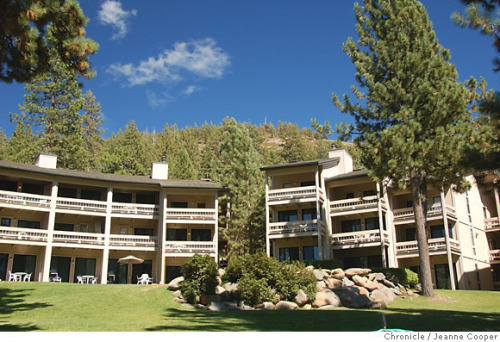 Nestled on Lake Tahoe's northernmost peninsula, Brockway Springs condominiums are surrounded by the legendary splendor of the High Sierra a crisp, high altitude environment, blazing Sierra sunsets, and cool, clear Tahoe waters, surrounded by awesome peaks. This is the Tahoe Mark Twain and John Muir wrote about. A Tahoe of unspoiled majesty. Brockway Springs Resort enhances this beauty with access to unlimited recreational opportunities. Whatever your mood or lifestyle, our unique location can provide for it all. If no available units are listed, please do not hesitate to call us at 888-434-1262 to check for additional availability.